One afternoon a couple years ago I got an itch and sculpted this little guy. A little stress reliever. You may see more elaborate sculpting attempts here in the future. Awesome! I love how you did his tail wrapping the base. So nice! Very cool. What did you work with? It doesn't look like clay. Cutest lil thing in the wooorld! By the way, you designed the JOTS brand POGs back in 1995, right? My friends and I were obsessed with "Sponge" and after an embarrassing number of hours searching, I just recently was able to track one down on eBay. Hey thanks everyone. And thanks for stopping by. Jason, ha haaa, wow! Yes I did design the Jots brand pogs back in the 90s. I was 15 years old when I did those. That is crazy that you remember them and actually liked one enough to warrant a pillow being made. (which your friend executed well.) What a surprise. I might post some of those pogs and artwork one of these days when I feel very brave. 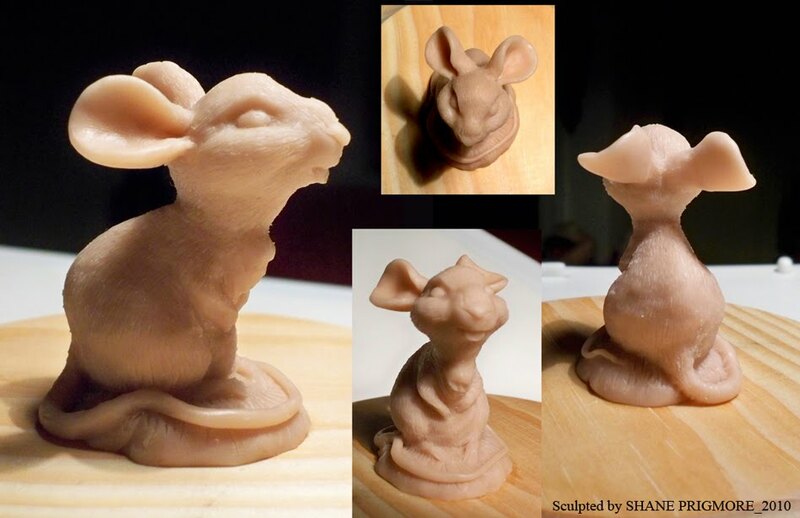 I used whats caled super sculpy to sculpt this little guy. You can find it at arts or craft stores. Try it out. Are you the same Shane Prigmore that did the animation for Nova Ark back in the 90's? Cute characters. I have a complete sheet of pogs from Nova Ark signed by you in 1994. Is it you? Yes, I designed the Nova Ark pogs back in1993. But I might have signed those in 1994. I signed a lot of Jots back then. This is hilarious. Those Nova Ark pogs are some of the most rare for sure. I actually just found the original drawings for those today. Crazy. I started designing Jots brand pogs back in 1992. I created several lines of pogs and merchandise that must still be out there somewhere. The endangered species line was probably the most scarce, so I dare anyone to find those. I was definitely a young, Inexperienced artist back then, but it was an amazing professional learning experience. Thanks for the inquiries. It's a blast from the past. And again, I may post some of the Jots stuff sometime soon. Stay posted. Really nice piece. I love the fur texturing! Shane, this is beautiful. Really inspiring!! Thank you, admin, for this post.